I'm not sure which of my great-greats this is, since I got a rambling story from my dad. I'll ask my mam next time I talk to her. An interesting face. goodness, he's so BIG! is that the original or a copy you had made? There's a face under that hair? All I can see is the tip of a nose and two eyes poking out of the shrubbery, quick, get your machete and free him! Holy Wow. 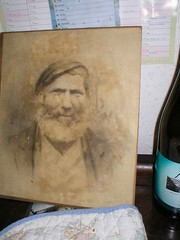 That's a GREAT photo of an ancestor. Seriously. That is amazing. I would love to have something like that from my family's past!